They gave us 9 nice long races. 5 on Saturday and 4 on Sunday. The sailing was very challenging (in a good way). As Len put it, it was all about changing gears as the wind picked up and died off and the waves from motorboats came and went and as the wind curved around the point and through the slot. Len sailed great and placed second, only one point out of first. Tom Hutton also sailed great finishing 7th. The rest of us had our moments of glory and infamy. For example, I finished 13th but had a 2nd in one race! Deep Creek has set the date for their annual invitational regatta to be July 18-19. Join them for an exciting, fun weekend of competitive racing in a relaxed mountain setting on Deep Creek Lake in Western Maryland. Each year sailors from Fishing Bay, Virginia; Annapolis, Maryland; Washington D.C., Pennsylvania and Ohio escape the summer heat to join the Deep Creek Laser fleet to sail in fresh water and cool breeze. Enjoy a 10 minute sail to the race course, intense racing, lunch break, more racing, then relax on the deck with a cold beer or soda. The racing format consists of two fleets – Open and Junior. In the Open fleet adults and advanced juniors to race together and can change sails (full, radial, 4.7) throughout the regatta. The Junior fleet is strictly for sailors under 19 and sailing with 4.7 or radial sails. Deep Creek Yacht Club would like you to join them for an exciting, fun weekend of competitive racing in a relaxed mountain setting on Deep Creek Lake in Western Maryland. Each year sailors from Fishing Bay, Virginia; Annapolis, Maryland; Washington D.C., Pennsylvania and Ohio escape the summer heat to join the Deep Creek Laser fleet to sail in fresh water and cool breeze. Enjoy a 10 minute sail to the race course, intense racing, lunch break, more racing, then relax on the deck with a cold beer or soda.The racing format consists of two fleets – Open and Junior. In the Open fleet adults and advanced juniors to race together and can change sails (full, radial, 4.7) throughout the regatta. The Junior fleet is strictly for sailors under 19 and sailing with 4.7 or radial sails. Fair winds and warm temperatures greeted the Laser racers the weekend of July 23 and 24 for the 2011 Deep Creek Lake Laser Invitational Regatta. Sixteen Laser Fleet sailors raced six long and challenging races in the vicinity of Holy Cross and Deep Creek Yacht Club, Inc (Deerhaven). Dave Mahan was the Laser Fleet Principal Racing Officer (PRO); he provided triangle courses with a windward mark finish with marks close enough to shore to provide some interesting and challenging racing in the light winds. Six races made up the Regatta with racing so close competitors had to wait for the official results to learn the trophy winners. Darrell Van Hutten locked up first place after facing heavy competition from the DCL Sailing School instructors, local competitors, and several off-Lake sailors. Fifteen Laser-Junior Fleet sailors raced nine races in separate courses in the vicinity of Deep Creek Yacht Club – Turkey Neck. The Laser-Junior Fleet Principal Racing Officer (PRO), Josh Bullock, provided a variety of races including triangle and windward-leeward courses for the Junior Fleet sailors. Lively discussions were held by the Junior Fleet sailors on racing rules and tactics. The Junior Fleet has some amazing young sailors, including first place winner Jon Benhart, who will be giving the more experienced sailors in the Laser Fleet a run for their money shortly. 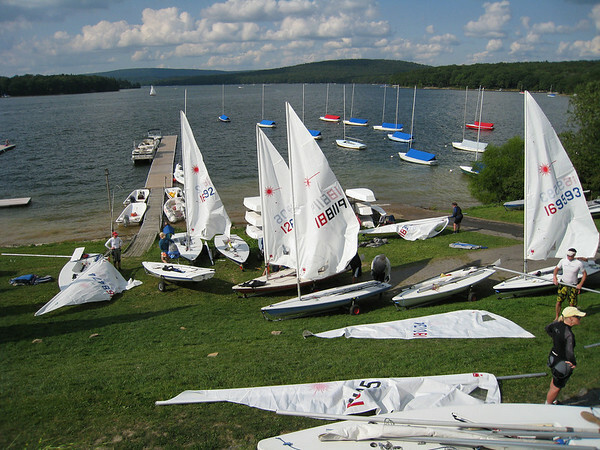 The Deep Creek Laser Invitational Regatta for 2011 is scheduled for the 23-24 of July. The event will be held in conjunction with the Deep Creek Flying Scot Women’s Regatta and Junior Regatta. Any ICLA member who attends 3 or more events will be qualified to be scored in the series. Women, Radial & Junior sailors qualify by attending one event less than half of the events which had fleets for the respective groups. There will be awards for 1-3 overall, 1st Radial, 1st Junior, 1st Woman and the best finishing sailor who travels to the most events. Scoring will be based on a high point scoring system where a point is awarded for each boat a sailor finishes ahead of. Best 3 events count for scoring purposes.